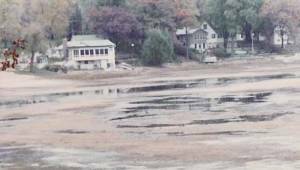 When Salem Lakes dissolved its water patrol department, we lost their services. So the Town Board is working with Paddock and Camp Lakes to contract with Racine and other Deputies to patrol on weekends and holidays. The times of patrol and specific personnel will vary. Everyone needs patrolling at the same high-traffic times. The pool of Deputies will do its best to cover all the lakes. Wheatland bought a used boat from Randall. It will be available for rescue operations if needed. Last year just 5 citations were issued. Tickets are decreasing because the water patrol has tamed wild boaters. Mike Adam started taking water samples in April. On May 9, the water level was 757.3, which is 8-1/2 inches below the level just before ice formation. On July 7 at 10 AM, Mike will run a "know your lake" session at the beach. Rain date is July 14. If enough watercraft are available, attendees will look at various things of interest around the lake. On Nov. 10, our contractor added 124 Northern Pike to the lake. Anecdotal evidence says that there are fewer small fish around the piers. Marine Biochemists has warned the Town that the DNR is changing its weed treatment policy regarding Milfoil. They are going to require whole-lake treatment. They want to avoid damage to native weeds. Treatment would be early in the season. There probably would not be any late-season spot treatments to contain Milfoil patches with unexpected growth. The expectation is that we'd do a whole-lake treatment and then nothing for several years. Spot treatment would only be allowed to correct navigational issues. Right now, it's unclear what the final DNR rules will be. The new regimen would start next year. A whole-lake treatment costs around $18,000, which we have not budgeted for. The price varies by depth and concentration of the weed killer. Lots of variable affect effectiveness. Hopefully, more will be known about the new DNR rules by the time of our annual meeting in August. The beach is groomed, but weeds still grow. There is a hole near the black pipe that's a tripping hazard. The Town has tried to fill it in, but rain moves the sand around. The Town tried a shorter pipe and rip rap, but people throw the stones into the lake. The rip rap near the boat launch also gets thrown into the lake. A resident contacted WE Energies to see if the street light near the beach could be changed to LEDs to improve brightness and discourage the kind of activities that take place at the beach at night. The answer was no. You may get resident complaints about the lights being too bright. We cannot do anything about the migratory geese that fly in for a short time. No one has reported families of geese hanging around the lake. A Lilly Lake resident plans to set up a temporary slalom ski course for a couple of hours on Tuesdays and Thursdays. It's just one person, the requester, who will use the course. He has the right to do that as part of the normal recreational use of the lake. He came to the Town Board to see if it would change the ordinance that calls for only counterclockwise movement on the lake. The Board said no. The course will be roughly 850 ft x 70 ft running east and west. Residents are concerned that the course will effectively use up the length of the lake. The skier goes fast and will probably dominate the lake. This is borderline commercial. On the other hand, the skier may find that the lake is just too small for an effective course. The skier has to observe all the rules that apply to normal boating on the lake, e.g., distances from shore and from other watercraft. Jason Roberts is the DNR recreation warden and can provide details on what is permissible. DNR weed control policy has been an issue for the past few years, and it will continue to be contentious. The DNR doesn't approve milfoil treatment after midsummer unless it's a navigational issue. Bays are typically affected. The DNR is increasingly in favor of whole-lake treatment. If what you're doing now is controlling the milfoil, keep doing it. Otherwise go to whole-lake treatment, which is very expensive. Also, there's a transition year in going from spot to whole-lake treatment that is usually a mess. The usual guideline is to treat early and well. However, some years the milfoil comes up late, and it appears that the 2-4-d herbicide is not doing the job as effectively as in the past. Milfoil may be becoming resistant. We've been treating just the shallow zones. You have to weigh the cost / benefit of single treatment vs the expense of whole-lake treatment. Potter Lake in Walworth county, a 155-acre lake, did a whole-lake treatment with fantastic results. Fishing after treatment was great. They expect 3 to 4 years of good weed control. Survey - Our last whole-lake survey to map the milfoil was done in 2009. It's time to do it again. Grants for small-scale projects like surveys are easy to get. Grants for big projects are virtually impossible. That money usually goes up north. Build up cash reserves - We need to build up the cash we'll probably eventually need for a whole-lake treatment. Try different product - Do spot treatments with a different product, e.g., Sonar aquatic herbicide. 2-4-d does its job in about 7 days. It's not a seasonal kill. Sonar keeps a low level of herbicide going over time. The initial hit is about 4 parts per billion (ppb). The ongoing level is about 2 ppb. 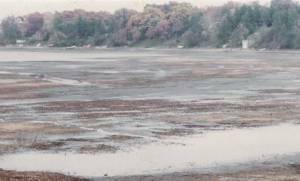 Lake conditions can affect milfoil density. You need to determine if high milfoil density is a one-time event or a trend. Wind Lake is infected, and it's not pretty. Luckily, the weed has not yet migrated to other lakes. However, it's expanding its range. On Wind Lake, it has gone from 50 to 75 acres and is getting into the channels. Lake level has been steady at 757.3 ft. The quality is good: the latest Secchi test was 14 ft. Phosphorus is at 14 ppb. The fish stocking is complete. This has been a low-goose year. There was only 1 roundup in this area. The foxes may be getting the geese. Only 2 citations have been issued so far this year. Last year there were 5 by this time. As part of a 3-lake partnership, we'll be getting reimbursed 60% for the patrol. The boat price is prorated. The subcommittee for beach improvement will meet this fall. Residents approved an increase in the District assessment from 13 cents to 19 cents per $1000 of assessed value. We need to rebuild our treasury after multiple weed treatments in 2017 and the fish stocking. Also, we have to plan for the more expensive Sonar herbicide and a possible whole-lake treatment in the future. 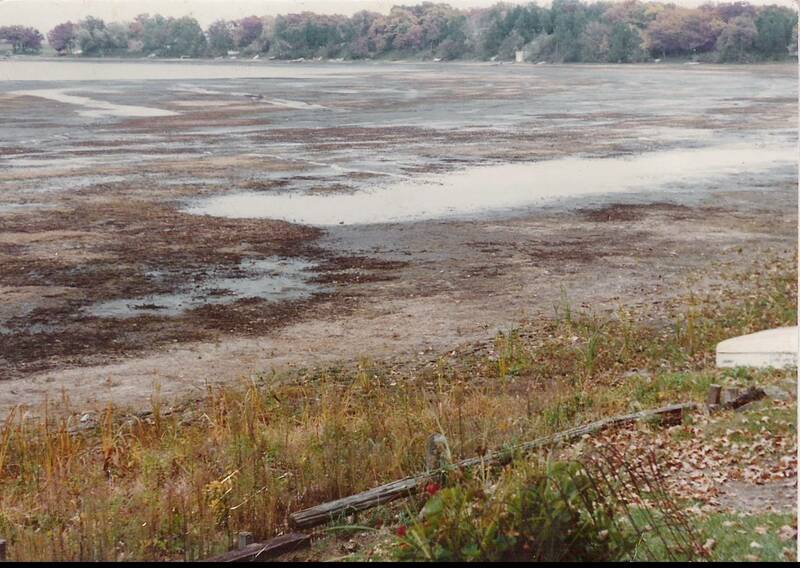 By 1970, the process of vegetation decay had filled the lake with muck to the point where the maximum water depth was 6 ft. Weeds were rampant. Underlying organic sediment was 30 to 35 ft deep. Some spots were so shallow that you could not run a motor boat. Activities like fishing and water skiing were very limited, and the experience was low quality. Winter fish kills caused dead, smelly fish to wash up on the shore in spring. No one was putting any money into the area. There was a real risk that property values would decline significantly due to the worsening condition of the lake. Studies resulted in a proposal to dredge about 890,000 cubic yards (550 acre-feet, that is, 550 acres to a depth of 1 ft) of sediment out of the lake to increase the depth to about 22 ft. Some of the muck was spread on nearby farm land, but most of it was piped to a modified gravel pit about 2 miles away (off Hwy W, south of F and FR, near the Schwarz Nursery). Don Puchalski led the effort, starting in 1971. He worked with the Town Board, engineering firms, the State, and the federal government. Although the project started out as a local one, new programs initiated at the State and federal levels offered some help with the financing. Changing environmental laws and financing programs delayed project start several times. At one point, the 5-year permit ran out. The government did extensive testing to ensure that the sludge would not harm the environment. Engineer Associates of Elkhorn tested feasibility, prepared initial plans, and got a permit from the Wisconsin DNR. 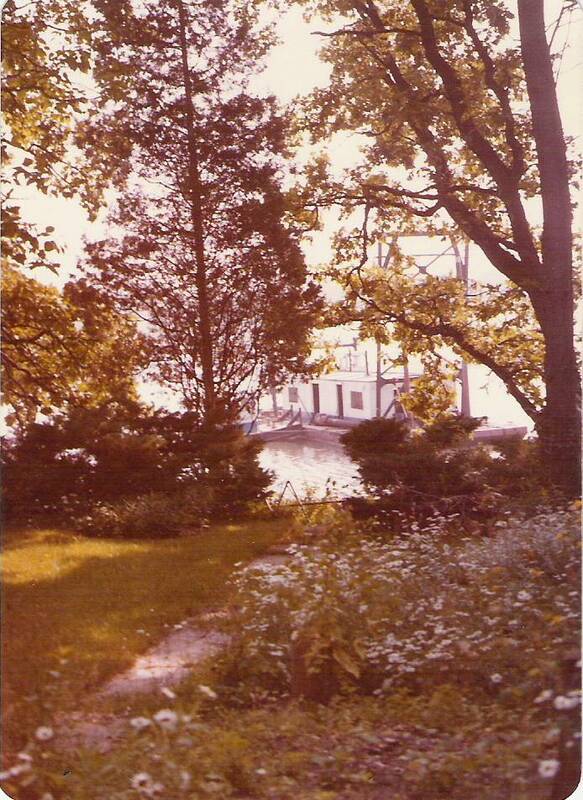 In 1974, Jensen and Johnson of Elkhorn took over planning and preparation of environmental impact statements. Johnson and Averill of Waukesha completed the design and development of the whole project. Robers Dredge of LaCrosse did the dredging. Mann Brothers of Elkhorn constructed the disposal site. 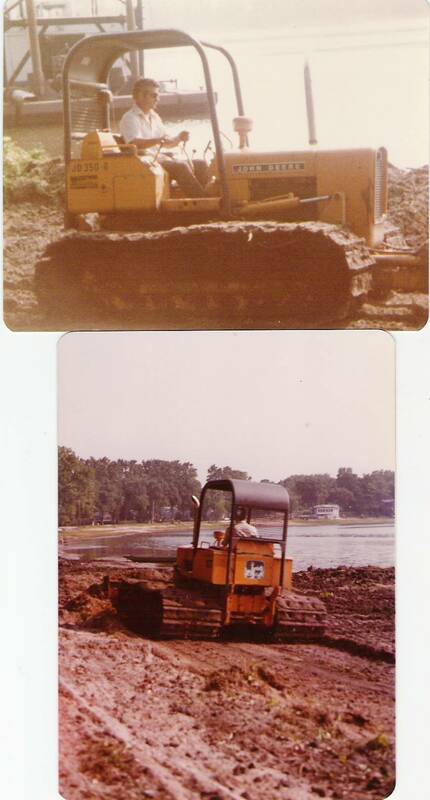 Dredging occurred over 2 years: July, 1978 through September, 1979. The first year, work started at 6 am and finished at 10 pm every day. 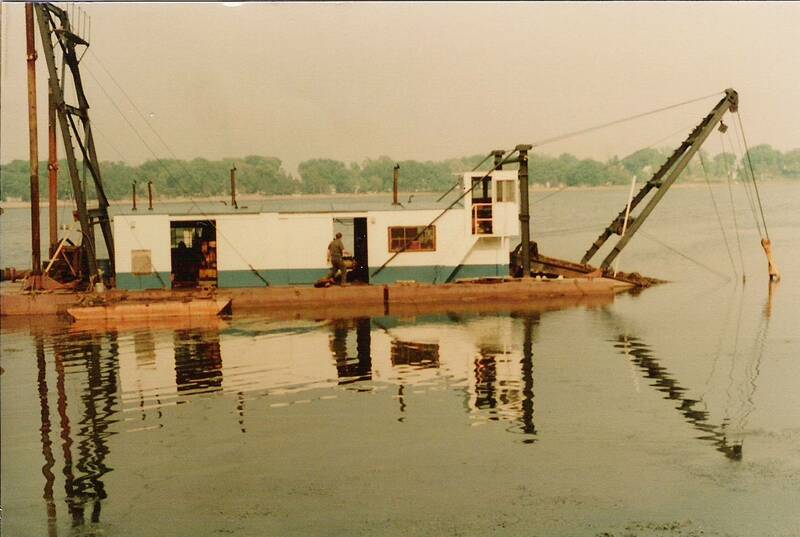 The second year, it was decided to run 24 hours/day for 4 days of every week to avoid the jarring noise of diesel engine startup at 6 am and to allow use of the lake on weekends..
A 12-inch cutterhead sucked out muck and weeds. Two miles of welded, 12-inch polyethylene pipe carried sludge to the gravel pits. A booster station around the Riley and Topczewski property helped pump muck up hill. Property owners were paid $0.15/ft per year for a pipeline easement. Some of the muck was also applied to 160 acres of farmers' fields. Farmers got $40/acre/year for the loss of use of their land. After project completion, they got the benefit of decayed organic matter on their fields. People report seeing fish coming out of the pipe at the gravel pit. The entire shoreline was cleaned and graded at completion of the project. 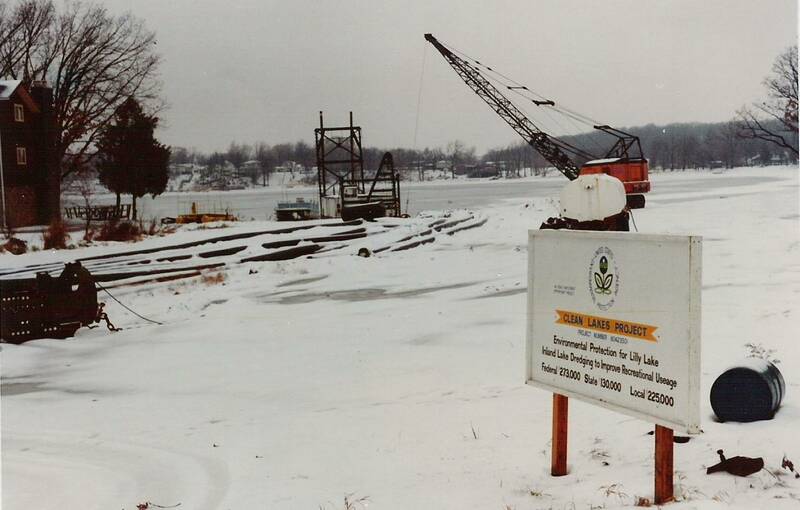 During the dredging, use of the lake was minimal. The shoreline stretched out 200 ft in places. You could do a little boating and swimming in the middle of the lake. One pocket (about 100 ft by 300 ft) on the north shore had to be left because the water level was too low to work it. 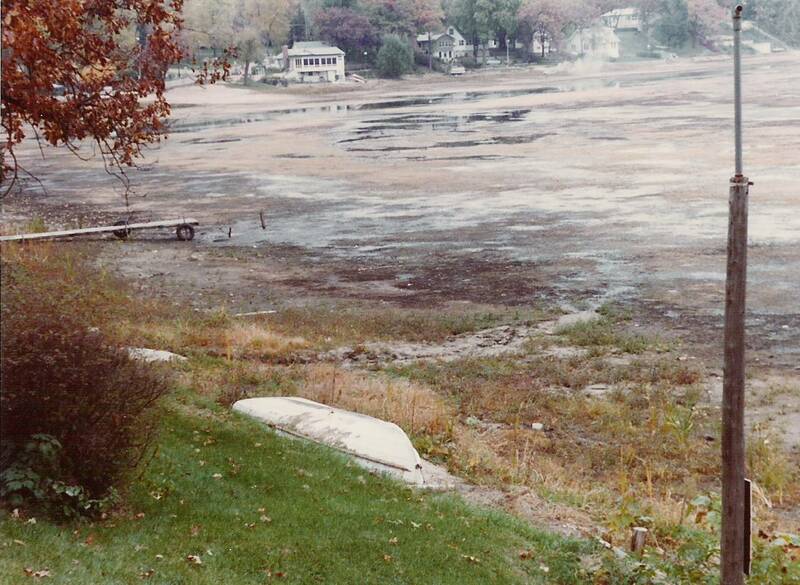 It was only in 1980 that the lake filled back out to its present size. Lilly Lake is consistently the cleanest lake in Kenosha County. All sorts of water recreation are now possible, including ice fishing and water skiing (which were virtually impossible before the dredging). Property values have increased substantially. Local businesses (like the current Lily Lake Resort) can capitalize on the recreation the lake offers. New muck is accumulating at the rate of about 1/4 inch per year. 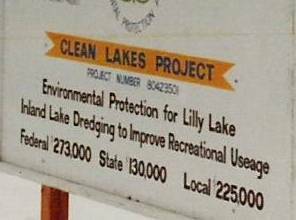 At that rate, it will be about 200 years before Lilly Lake has to consider another dredging project. 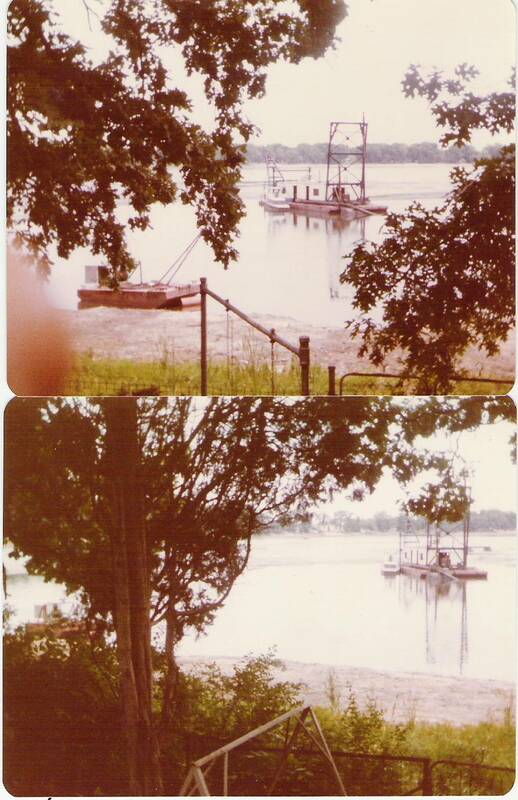 Many thanks to Kathie Cashman for these pictures of the dredging operation.